As a photographer, my skill set is constantly put to the test. In most cases I’m handed an idea on a slab of wood and the mission is to hand that idea translated to a tangible artifact back to my client on a silver platter. It’s never an easy process, but it’s apart of my job. I’ve shot in water maybe half a dozen times and I love it, I love the challenge and I love doing something different. 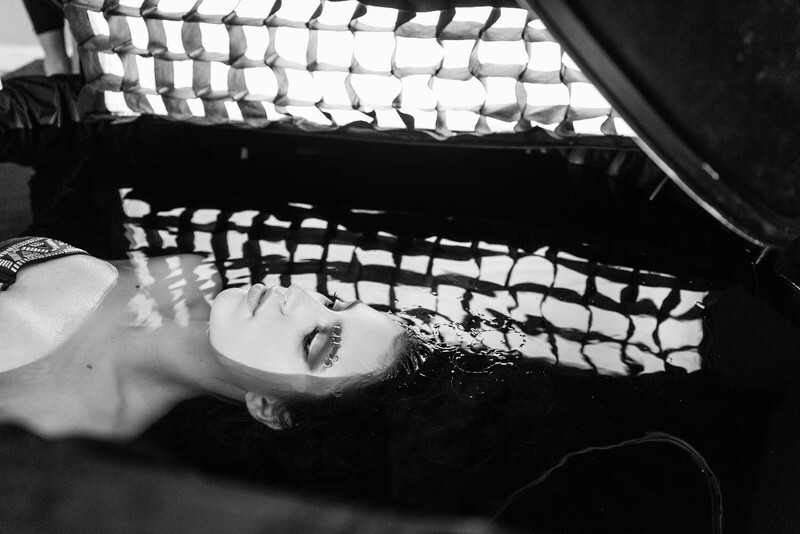 The idea brought forth by makeup artist Casey Ritchie was to shoot a model in black murky water, with only the face to be seen and the makeup as the stand out. 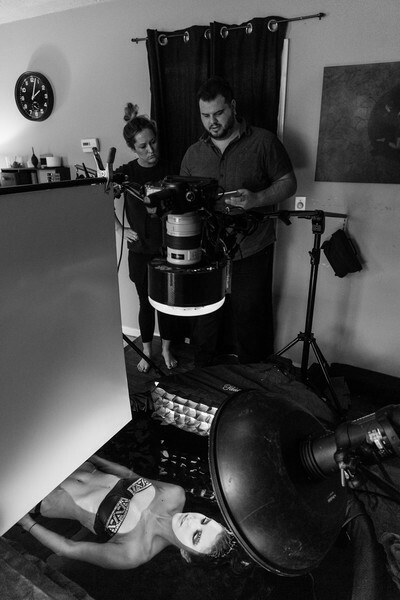 The first step was to think of a way to shoot this idea in a studio setting. The only way I felt it could be accomplished was with a simple kiddie pool, rather then using an indoor pool or bathtub, where it would be trouble to rig lights safely. 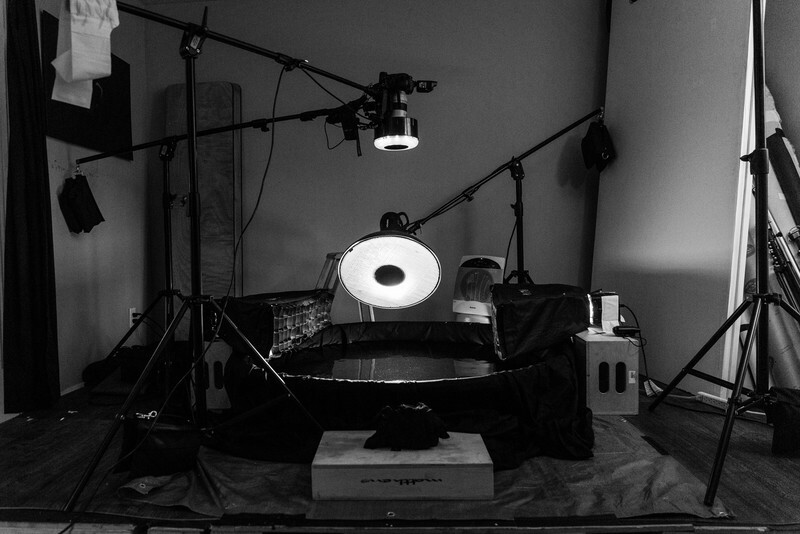 We placed the kiddie pool right on the studio floor and filled the pool with warm water, then draped a black cloth background over the pool and in the water. The next hurdle was lighting and camera placement. Fortunately, I have a lot of experience with booming my camera for a 90 degree overhead angle without the used of a ladder or crane. So, we secured a Canon 5D Mark III with a Manfrotto 026 Swivel Umbrella Adapter and wrapped a Vulture Equipment Works A4 camera strap around the head of the stand in case the adapter failed. I fired the shutter using the CamRanger; a wireless DSLR remote control and tethering system.The next step involved lighting the pool. Unfortunately, we could jump in the water for pre-lighting so, we had to guess and use the palm of our hands to predict how the light would fall on the face. The key light provided a powerful dramatic light from overhead and the sole purpose of the side lighting was to add some beautiful catch lights in the models eyes. The ringflash added a directional contrast and the white foamcore reduced the shadow density under the chin and body. We triple checked for security and safety; when dealing with water, you never want to cut corners and risk a model’s life. Unfortunately, we weren’t able to nail the lighting until the model was in the water; we fought with reflections and inconsistent shutter clicks, which wasn’t something I had ever had to deal with. About 20 minutes in the water, our model was shivering and very cold, I knew we needed to get the shot. I made the executive decision to send for a space heater and turn up the heat in our house. Luckily, Lindsey, our model, was an absolute trooper and was prepared to do something different. She fought the shivering and braced the luke-warm water through two more looks. By the last look, we had adapted to the scenario; my studio felt like a sauna and the air approaching 90 degrees. Three looks later we had the shot we needed and I could tell our model was relieved. We carefully broke down the lights and emptied the pool bucket after bucket. I wasn’t handed an easy scenario, but I certainly think we delivered a photograph worthy of a silver platter.